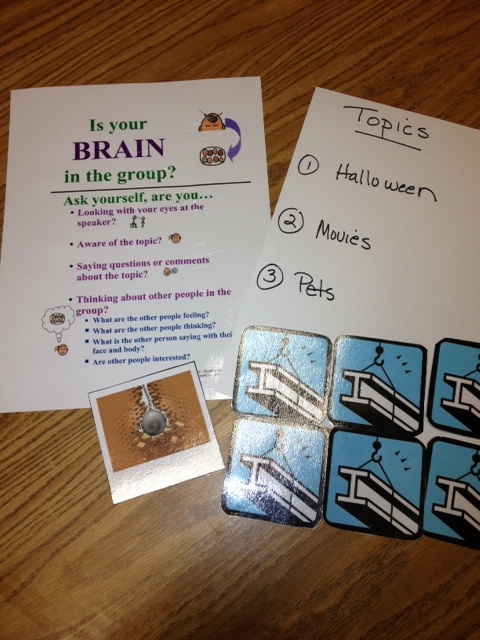 Today we combined the visuals for “Is your brain in the group?” and “The Building Game” for our social skills group. Keeping your brain in the group helps you to stay aware of the topic and saying questions or making comments about the topic. When your brain is in the group you are looking at the person who is talking and thinking about other people in the group. Topics for conversation were chosen and each person was given girder cards. As each person contributed to the conversation and stayed on topic, they placed the girder card in the middle of the table showing how we were “building” the conversation. If someone suddenly changed the topic or made a comment off topic, a wrecking ball card was thrown down. We will be playing the “Building Game” again and again! 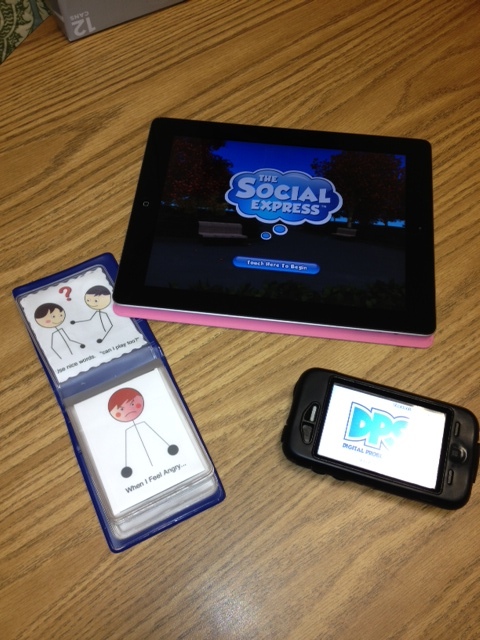 The Social Express app for iPad is the best app for social skills training that I have found. The fully animated interactive lessons are so appealing to our students. In the videos the characters use what is called a “Digital Problem Solver”. There is an app for iPhone for that as well. The DPS allows the student to scroll through a list of feelings and choose how they are feeling. Once that is done, the student then scrolls through possible coping strategies to help solve their problem. The results were fantastic! Each student receiving a homemade DPS is so proud of it. We observe them practicing with it the classroom and it has not taken long for them to become quite comfortable using it. Rock Brain will get a person to do only what he has decided he will do; he will not negotiate with others. He is not a good problem solver and tries only one solution that is not working over and over again. This person may be very rule-bound and rigid in his thinking, seeing only one way to a situation. Luckily, our social skills group knows what it takes to be a Flexible Thinker. We had a great lesson today. First, we reviewed our social story for being a flexible thinker. Next, the Ways to be Rigid visual led to a coaching experience. 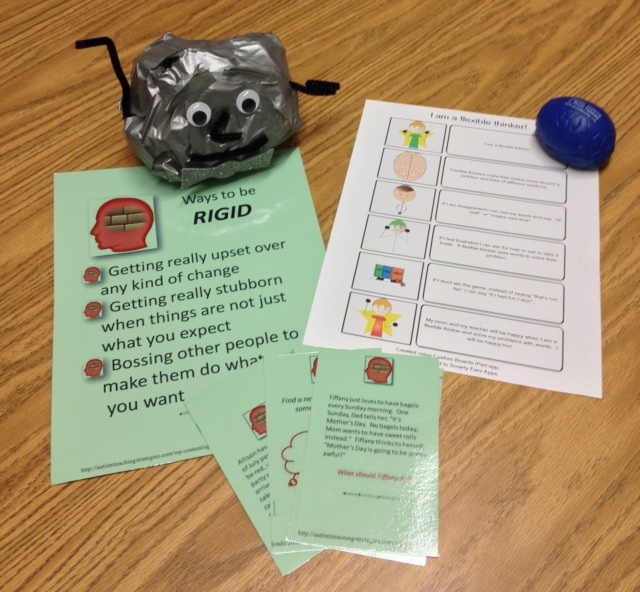 We discussed how to stop being a Rock Brain and be a Flexible Thinker in specific scenarios. It is sooooo very hard for some of our students to manage their thoughts and words without interrupting! All of their thoughts and words are important to THEM. But people do not like to be interrupted. It makes the speaker feel mad and frustrated that someone took away his talking turn. It makes the listener feel that the person who interrupted is rude with poor manners. 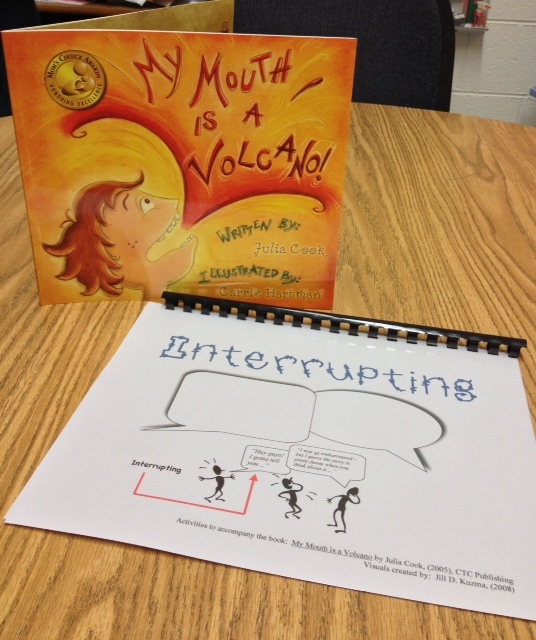 My Mouth is a Volcano written by Julia Cook and illustrated by Carrie Hartman is a delightful book to help students deal with the habit of interrupting. Jill Kuzma has created visuals to accompany the book at http://jillkuzma.wordpress.com. Great lesson today with 1st grade group. We used the above pictured visuals and a coaching experience to start our long journey toward managment of thoughts and words. 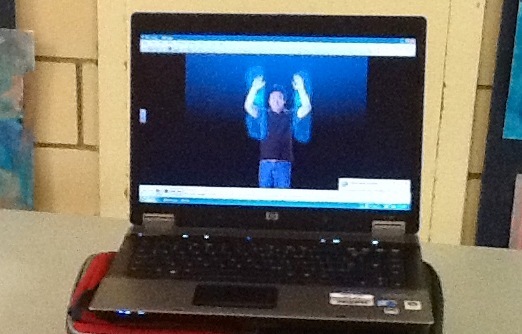 We have started using the Smart Moves video prior to beginning our lunch. It consists of 40 different movements that become increasingly more difficult. The moves require concentration and promotes both arms doing the same movement. Each new movement begins with a linear up and down motion and then a more difficult movement is introduced. Each set of movements ends with returning to the “home” linear up and down motion. It gets our minds ready to sit down and learn. Found this idea on Pinterest…dress up Mr. Potato Head and take some photos. 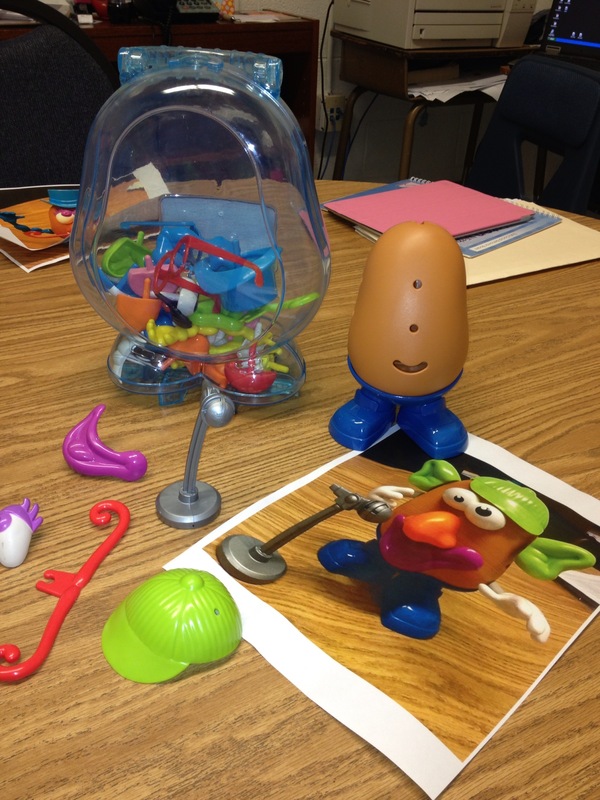 Get out all of his “stuff” and give your student a photo and direct him/her to replicate the photo. This makes a great “shoebox” activity. Requesting, describing and matching are but a few of the skills that can be addressed with this activity. Another great app for iPad from Mobile Education Store. My students love the movie quality videos in this app. They think they are watching cartoons while learning to use correct tense forms and sequence events. My favorite feature: if a student gives an incorrect response they have the option to go to a video tutorial on that particular verb tense and then return to the incorrect item and try again. $14.99 on the iTunes App Store. I highly recommend it! Fun, Fun, Fun with Buzz Blast! This is a great game! I bought it on Amazon for about $15. The folks who bring us Highlights magazine created it. Buzz Blast is a fast paced pass-and-play game. Players take turns trying four challenges-Silly Sentences, Tongue Twisters, BrainPlay and Check…and Double Check. A random timer triggers funny sounds when the time is up. You do not want to be the one holding the Buzz Blaster when you hear a MOO!, a BOING! or a MEOW! 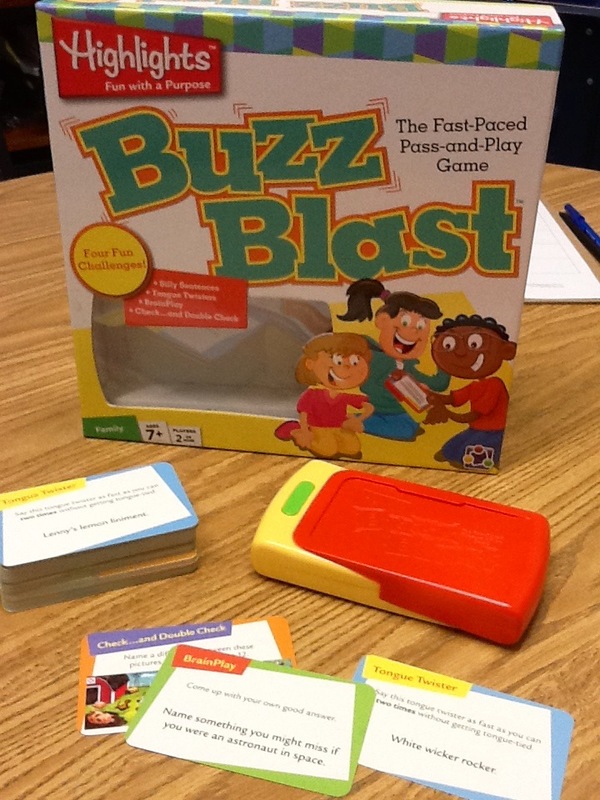 Things you can learn from playing Buzz Blast– Fast thinking, paying attention when others take a turn and good sportsmanship. Parents visit and join in the fun! I love it when parents visit Lunch Buddies groups. We have had 2 moms join us this week. They came to see what all the fun was about and left with an understanding of social skills training. OH Happy Day!! I am finally printing directly from my iPad. No more saving, emailing to myself, then printing down the hall. With one touch I can print to my new HP Photosmart Plus e-all-in-one printer. It scans, will fax and copy from iPad or iPhone. I bought it from Amazon for $79.